As a Maine Wedding photographer I love to create romantic images of couples in love. This one of my favorites as their expression communicates wanting and love. 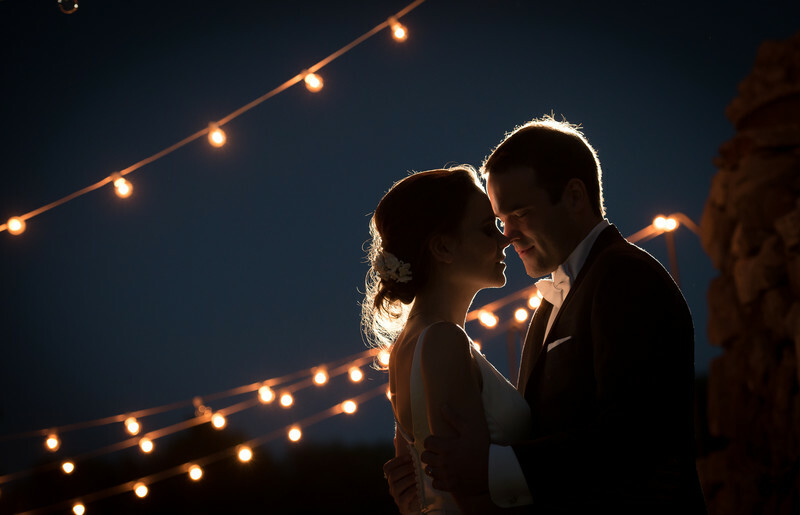 The fair lights above and in the background add an element of romantic atmosphere to the scene. This image was taken at the Atlantic Oceanside Hotel in Bar Harbor, Maine. Being a Maine wedding photographer it is locations such as these that offer many opportunities to make creative and amazing images. The hotel has a gorgeous ceremony location with ocean views, a lovely cottage house for getting ready and a ballroom for the party. It's an all on one location so there is no travel time eating into the wedding day. A wedding photographers delight! As a Maine wedding photographer I make a huge effort to bring couples together into beautiful locations. Here I spotted the overhead carnival lights, turned them on and set the scene for this image. The couples chemistry together creates the romance and the lights behind set the stage. A great wedding photographer is a master with working with any light source to create images the reflect the true beauty of subjects being photographed. Location: Atlantic Oceanside Hotel, Bar Harbor, Maine.